Laura Gehl and Joyce Wan join us today for the cover reveal of their brand new picture book, I’m Not Taking a Bath! Watch the video below, then keep reading to learn more about the inspiration behind the story. Can you tell us a little bit about the story in I’M NOT TAKING A BATH? Laura: I wish I could surprise everyone and say the book is about a superhero moose selling donuts while saving the world with his wisecracking sidekick Mr. Sprinkles. But actually the title is pretty self-explanatory. In this third Peep and Egg adventure, Egg has been playing with the pigs, and big sister Peep thinks Egg needs to take a bath. Well, anyone who knows Egg can guess that Egg is not planning to take a bath. No way, no how. And anyone who knows Peep can guess that Peep probably has a few tricks up her feathers to convince Egg otherwise! Joyce: The final art was created digitally in Adobe Illustrator but I always start by sketching out the entire book with good old-fashioned pencil and paper getting inspiration from real life, I even looked up the best bath towels during a period of writers block!. Laura: Joyce always amazes me with the layers she adds through her art. In this book, all the animals end up having a pool-party-style bath together at the end…including the pigs. But Joyce drew the pigs in a rowboat so that they can join in the fun without getting clean. The illustration makes me laugh every time I see it (or even think about it)! Joyce: Thanks Laura! I make the front endpapers a part of the story by showing Egg playing in the mud with the pigs (with Egg hidden under the front flap as a fun surprise) before the words begin. Being able to manipulate all the different parts of the book to add another layer to the story is one of the most fun parts of being an illustrator. What is something from your childhood (or now) that you had to do that took a lot of convincing? Laura: My dad used to bribe me to hike up mountains using pieces of dark chocolate. Now I hike up mountains voluntarily, but I use dark chocolate to bribe my own kids to hike. And I eat dark chocolate every day, whether the day involves a hike or not. Joyce: Eating breakfast. Yes, I know it’s the most important meal of the day. I’m still not convinced but I’m working on it! Laura: I won’t say that it is difficult to convince my own daughter to take a bath. But if I tell you that I actually put her towel in the dryer beforehand, and then run up two flights of stairs with the heated towel, trying to preserve as much warmth as possible, in an effort to make the bath a pleasant experience for her…you can draw your own conclusions! Joyce: I just had a baby last year and I have to say giving her a bath is like wrestling with a slippery octopus. Thanks for sharing the cover of PEEP AND EGG: I’M NOT TAKING A BATH with all of us! 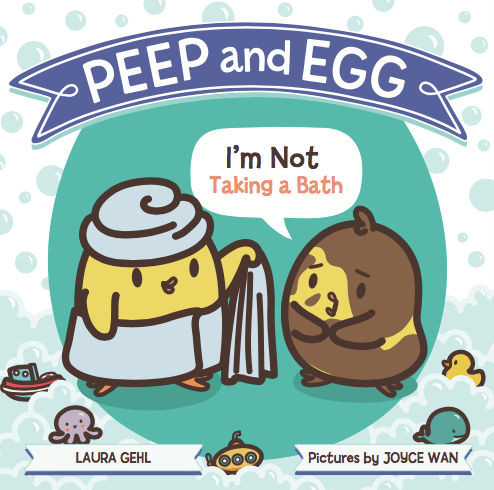 Peep and Egg: I’m Not Taking a Bath will be on sale from Farrar, Straus and Giroux beginning October 24, 2017. Laura Gehl is the author of picture books including ONE BIG PAIR OF UNDERWEAR and the PEEP AND EGG series. In addition to PEEP AND EGG: I’M NOT TAKING A BATH and PEEP AND EGG: I’M NOT USING THE POTTY (the fourth book in the series), Laura’s upcoming books include KOALLA CHALLAH (illustrated by Maria Mola), MY PILLOW KEEPS MOVING (illustrated by Christopher Weyant), and I GOT A CHICKEN FOR MY BIRTHDAY (illustrated by Sarah Horne). 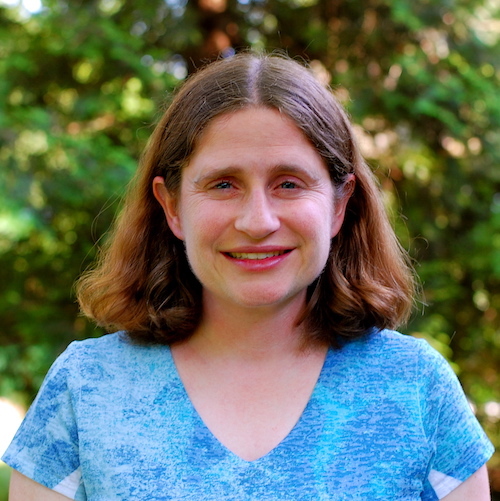 Laura lives in Chevy Chase, MD with her family, and you can visit her online at www.lauragehl.com. 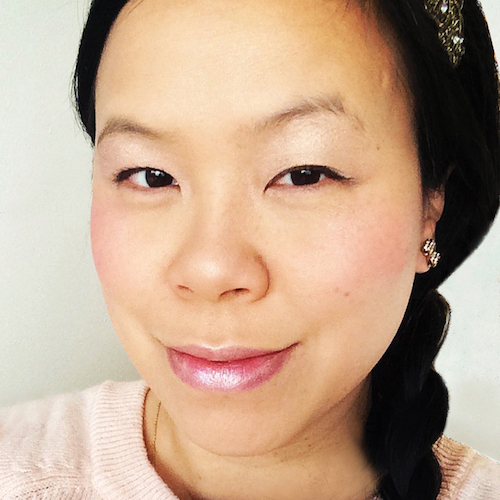 Joyce Wan is an author-illustrator who has written and/or illustrated twenty books for children including YOU ARE MY CUPCAKE and THE WHALE IN MY SWIMMING POOL. Joyce is inspired by Japanese pop culture, modern architecture, and things that make her happy. Joyce lives in Ridgewood, New Jersey with her husband and daughter and you can visit her online at www.wanart.com. Hooray for Peep and Egg! My class is going to flip when they see the new P&E cover! Great teamwork, Laura and Joyce! Thanks, Carrie! Joyce does an amazing job on all her covers, but I think this is particularly cute (okay, fine, I think that every time I see her art). Say hi to your class for me!